It was a rare example of dialogue in a region better known for its discord: On Sunday, about 300 Israeli students traveled to the de facto Palestinian capital of Ramallah to meet with the head of the Palestinian Authority. “I came here to hear for myself and without any mediators about what the other side thinks,” Assaf Grinvald, a 25-year-old Israeli who served in the Israeli Army as he waited to listen to Palestinian President Mahmoud Abbas speak. The grass-roots attempt to revive deadlocked peace negotiations was organized by Member of Knesset Hilik Bar from the Labor Party. The peace process is at a stalemate as the April deadline given to both sides by Secretary of State John Kerry looms. 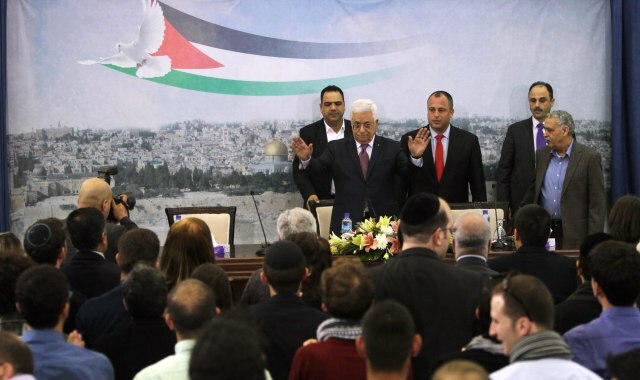 The fate a Palestinian state existing alongside Israel lies at the heart of the differences. The more than 550,000 Israelis living in the occupied West Bank and east Jerusalem amid around 2.5 million Palestinians put the establishment of the future state in doubt. Many Israelis, meanwhile, contend that Palestinians are not a genuine partner in peace, and instead are negotiating in hopes of eventually driving out Israelis.